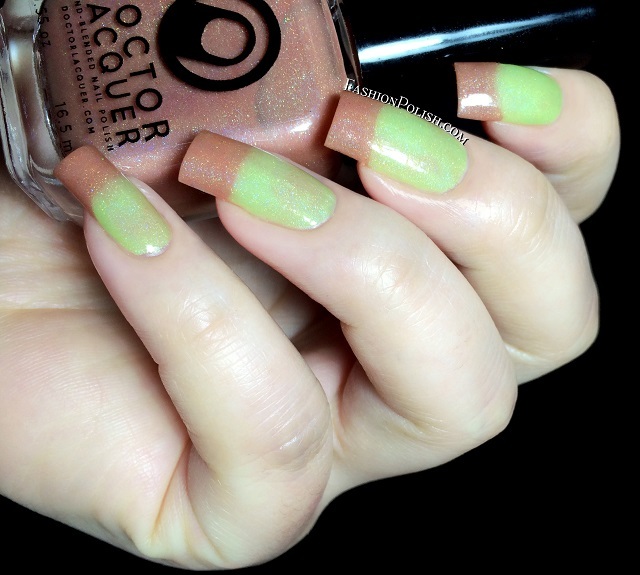 Fashion Polish: Doctor Lacquer coHOLOrful traits collection review! 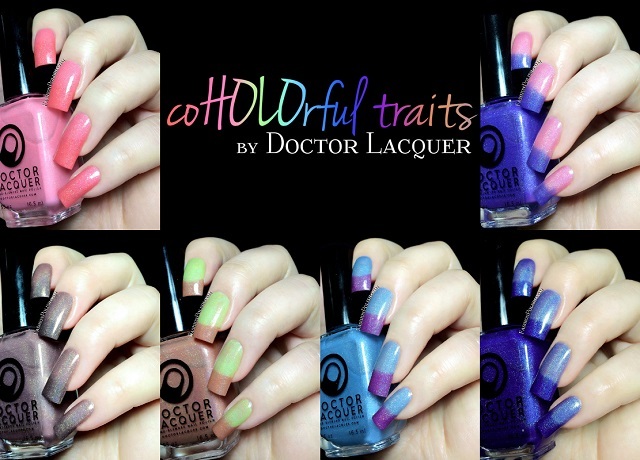 Doctor Lacquer coHOLOrful traits collection review! 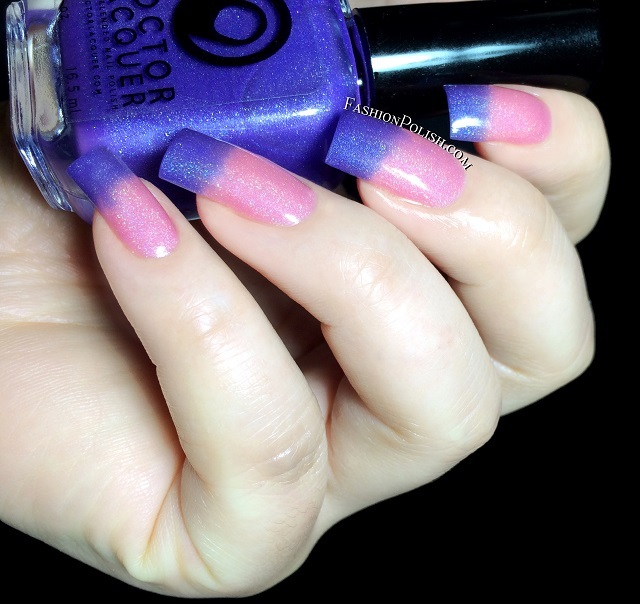 I have a new indie brand to share with you today : Doctor Lacquer! I first discovered Doctor Lacquer when its owner Angelyn asked me if I'd be willing to help out with swatches on Instagram and although I was only supposed to do that at first, I was so impressed with the collection as a whole that I just couldn't not share them on the blog! The coHOLOrful traits collection is a set of 6 holo thermals : 3 warm vs 3 cold sensitives. Purple (cold) to pink (warm) scattered holo thermal. Warm sensitive. Cobalt blue (cold) to light cornflower (warm) linear holo thermal. Warm sensitive. Hazelnut (cold) to green (warm) scattered holo thermal. Warm sensitive. Bubblegum pink (warm) to salmon (cold) scattered holo thermal. Cold sensitive. 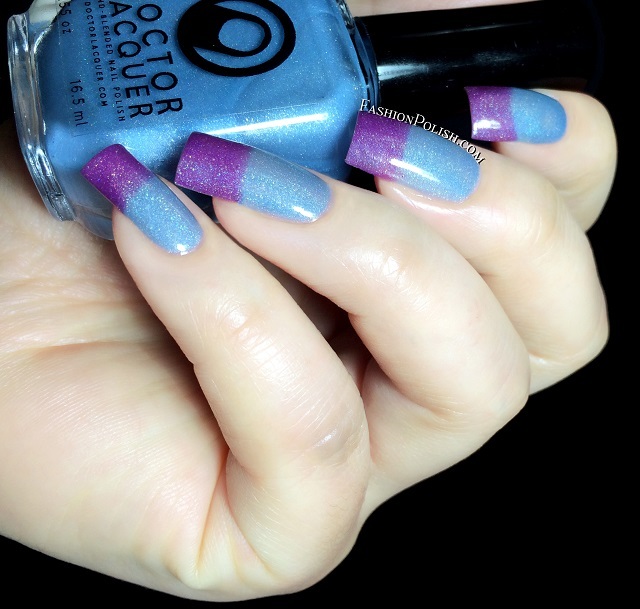 Carolina blue (warm) to purple (cold) scattered holo thermal. Cold sensitive. Mauve (warm) to taupe (cold) scattered holo thermal. Cold sensitive. Consistency was a tad sheer but these all applied nicely and dried quickly. I loved the thermal transitions and found it particularly sensitive so that was definitely a plus too! They all make such a nice and fun collection that I don't think I'd want to part with any but if I really really had to choose I'd go with True Compassion. I've never seen a linear holo thermal before, it's a must have! The coHOLOrful traits collection can be purchased on DoctorLacquer.storenvy.com / Etsy and retails for $11.99 each or $68.94 for the full set. So what do you think about about these? Have you ever tried thermals?